Recently tattoo-lovers pay more and more attention to so called ethnic or tribal style in tattoo designs, that includes images of such ancient peoples as Maori, Slavs, Celts and Indians, of course. When it comes to the latter ones, Aztecs and Mayas are the first to come to our minds. These types of tattoo are rather complicated, not because of their visual wittiness, though a hand of a true artist is needed their of course, but because of their deep semantics we have to remember of. Tattooing was wide-spread throughout various ancient civilizations as a sort of social markers and communication media. The Aztec people, who lived around 600 years ago, are probably the best-known tribe that reached the highest point in the craft of decorating skin, leaving us a huge heritage of aesthetical and symbolical images. 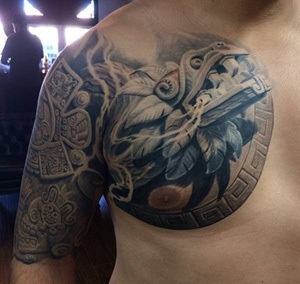 Actually, they lifted up tattoo to the level of art, making diverse and intricate designs. Some of them were sacred for the Aztecs. We should note that art in general played an important role in life of this civilization. For instance, kids earned pottery from their early age. 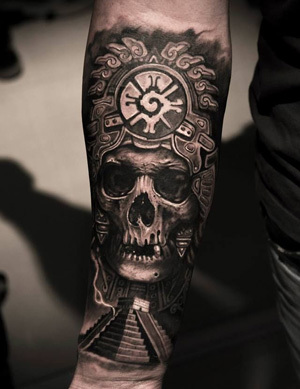 Most of the tattoos for the Aztecs had religious, spiritual and ritual significance, connected with worshipping of the huge local pantheon of gods, which occupied a huge place in their everyday life. The most important God for the Aztecs was Huitzilopochtli – a deity of warfare, sun, a guard of the heavens that gives life. Huitzilopochtli is usually depicted as a hummingbird or as a warrior with armor and helmet made of hummingbird feathers. His legs, arms, and the lower part of his face are painted in blue and the upper half of his face in black color. He is shown wearing a lavish feathered headdress and brandished a round shield and a turquoise snake. Connected symbolically with the Sun, Huitzilopochtli was also seen as a symbol of resurrection and afterlife, the same way our star "dies" and "revives" day by day. The Aztecs believed that to nourish Huitzilopochtli and keep the world in motion, they needed to feed the god human blood every day. For this reason, the Aztec priests conducted daily human sacrifices at the Great Temple in their capital city of Tenochtitlan. Aztec ceremonial knife used during human sacrifice in the name of Sun god, is also a popular tattoo motif, along with Tezcatlipoca - a central deity in the Aztec religion, known as a Creator god, the god of sustenance, a patron of warriors and change through conflict. In most of the images he was shown with his tongue out; the same motif could be found in the art of Maori tribe. A feathered serpent deity Quetzalcoatl was worshipped both by the Aztec and Maya peoples. He combined functions of vegetation deity, the god of winds and rain, and as the creator of the world the patron god of priests and merchants and the god of learning, science, agriculture, crafts and the arts. 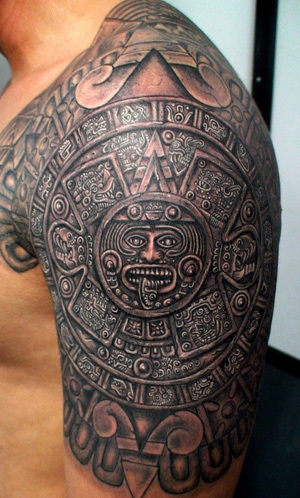 Another popular Aztec tattoo motifs included eagles, warriors and the Aztec calendar wheel. Apart from the images of the Sun, Indians used to apply designs with the Moon and starts, which are still poplar nowadays. Curiously, but it is not only adults Aztecs who wore tattoos, but youngsters as well. Contemporary people choose Aztec tattoos make them because of their visual attractiveness, as they were rather vivid and pronouncedly stylized, as many other Aztec art pieces. These culture was highly developed, which is proved by the complicatedness of their architecture, sculpture and textile. This complexity applies to tattoos, which are usually made as witty black and white drawings with numerous details and thus rather time-consuming. As many other tribes, Aztecs believed human body has certain energetic centers. They included stomach, chest and hands. It was thought energy flows through these parts and we can enhance our communication with gods by placing tattoos on them. Only small pieces of the grandiose Mayan civilization with its rich art and culture have survived till nowadays. A significant part of its heritage was lost in the whirlpool of history. That is what makes Mayan tattoo so special and tricky to apply. 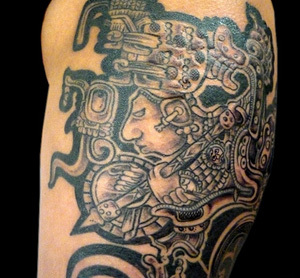 The Maya renders tattoos using surficial cutting of the skin that had been colored with pigments beforehand. To strengthen the design a special mixture based on clay was rubbed into the wounds. Quite often this type of body decorations is confused with Aztec tattoos we've already talked about. The principle difference between them is that the Maya preferred compositions with military symbolism, while the Aztecs inclined towards religious one. Today most of the tattoo salons of various prestige and quality will offer you a Mayan style image with pyramids or eagle. However, you shouldn't stick only to those stereotypic subjects – just switch on your imagination! Thanks to the documentary films about Maya civilization, some new imagery gains popularity, like the crystal skull – a type of the pre-Columbian archeological artifacts, covered with mysterious stories. All members of the tribe worshipped different deities, among which one of the central places occupied the deity called Acat. He was thought to be a patron of tattoo artists, who blesses the ink, and other materials used in this art. The Mayan men were famous as great warriors, so they covered their body with signs of the great victories and noble deeds. Some of those tattoos resembled true scars, proving the owner's courage and bravery. Since the whole process was very painful, the more tattoos a man had, the more respect he gained from the society. Male tattoos could also be the sign of an Indian who had broken the law. It could also tell about the family status of a person, since bachelor young men had no tattoos. If a married man refused to get a tattoo, he was scoffed at. Totem animals was also a crucial topic for the Mayan tattoos, as well as an image of the Sun that reminded of the life cycles. Solar tattoos were mainly depicted in the form of circle or ellipse, or with usage of this figure, merged with another ornament. Some of the Mayan tattoos are defined by inclusion of the enigmatic hieroglyphic script, noteworthy for its exuberant graphic and laconic character. Lavish ornamentation makes it a difficult job only an experienced tattoo artist, so find a master whom you trust!